In five days, just at the start of the Bank Holiday weekend, Guild Wars 2 launches. I have, as my girlfriend will confirm with some resignation, been spending an awful lot of time in The Secret World (4 days, 14 hours since launch, says the depressingly accurate /played), and this week the long-rumoured Co-Op Horde Mode for Team Fortress 2, Mann vs Machine, was released to some fanfare. So many games, so little time. It’s not a perfect thing. The new mode appears to have brought with it a great deal more crash-happy client, which is making a hard game – and MvM is really quite hard – even more difficult. Steam reports that – again, since launch, I’ve dumped almost 200 hours into Team Fortress 2. Almost all of which is concentrated into three phases. When the game launched I played mostly Engineer, setting up defensive encampments and fallback positions for the team. After a while, game balance started to shift, and when a few patches down the line it stopped being fun, so I switched to Heavy/Medic, swapping roles as teams required. Later, I switched to Pyro, which is my general class. MvM has made it fun to play an engineer again. Now, doing that with a level one turret is probably overkill, but the tag on the intro slide “Area Denial” is what I like the Engineer to do. The MvM Engineer is support, but also area denial. It’s all about placement and – crucially – getting the turret out before it gets sentry bombed. 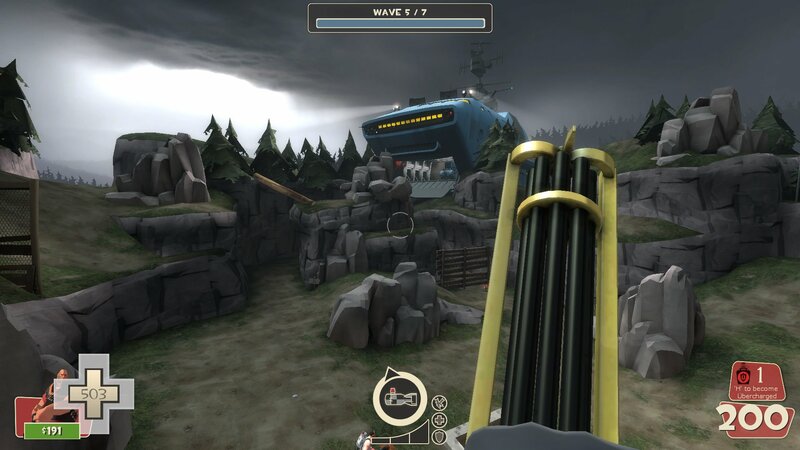 MvM, with its inline upgrades system that reset each match, brings a lot of the Rock Paper Scissors of the original TF2 balance back to the game. Spybots are vulnerable to AoE, Pyros can’t do long range, Snipers can’t react quickly, Scouts can get there before you can aim, Engineers need to be bombed from afar or snuck up on, Heavies are slow but pack a punch. For being a lot more complicated at launch, it’s a lot purer a game to play, much more so than the confusion of weapon-drops and hats that is a newbie’s introduction to plain TF2. I am Aquarion on Steam.